The play of colors seen in opal is caused by the diffraction of light from regularly arranged transparent spherical particles of cristobalite, an amorphous silica, and the voids between these particles. These microscopic particles have a diameter of approximately 1/10000 of millimeter. The angle of the light diffracted varies with the wavelength, and thus only pure spectral colors can be seen. The name opal comes from the Latin « opalus », which in turn is coming from the Greek « opalios », itself coming from the Sanskrit « upala » meaning precious stone. Archaeologist Louis Leakey found six-thousand year old opal adornments in a cave in Kenya. The ancient Greeks believed opal could give to the wearer the power of foresight. The Romans revered opal as the symbol of hope and purity, and believed it could protect from disease. Eastern people regarded it as the symbol of truth. The Ancient Arabs believed it came from heaven, and that it acquired the play of color from flashes of lightning. In the Middle Ages, opal was thought to be beneficial for eyesight, some people even believed it could render the wearer invisible. French Emperor Napoleon gave to his wife Josephine an opal called « The Burning of Troy » because of its strong play of colors. In the nineteenth century, a superstition brought on by the novel « Ann of Geirstein » of Walter Scott, in which opal is described an unlucky stone, eclipse temporarily opal’s popularity. But public figures such as Queen Victoria as well as the French actress Sarah Bernhardt did reestablish the gem’s popularity. 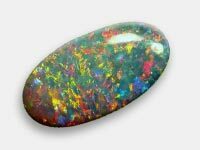 Opal is classified in three primary types according to its body color supporting the play of colors. These types are black, white and transparent. 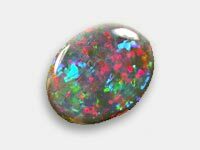 Transparent opal can have body colors such as colorless, yellow, brown, red or orange. The later is better known under the name of fire opal. Many further sub-classification are done based on the quality and the distribution of the color patches. The most famous are harlequin, pinpoint, flash, peacock and flame opal. Some types of opal do not display play of color. Among those there is the bulk of orange « fire », a green variety resembling chrysoprase called prase opal, and a blue green variety found in Peru. Due to the sedimentary process resulting from the concentration of silica gel in evaporating seas, opal always contains an amount of water ranging from 3 to 10% of the total weight of the stone. This is the reason why it should be protected from heat or strong light, which can dry the water out, causing cracks. Also ultrasonic cleaners, acids, or any strong solvents should be avoided. Opal is, alternating with tourmaline, the birthstone for October.